Magpies InterchangeJordan Russell off due to an injury. Swans InterchangeSam Reid off due to an injury. Magpies InterchangeNick Maxwell off due to the blood rule. BEHIND SWANSSydney work it from coast to coast. Goodes runs into an open goal 30 metres out but he misses. BEHIND MAGPIESCloke works hard to get to the front position. His shot from the pocket is across the face of goal for a behind. GOAL SWANSMcGlynn gets under his opponent and edges him out to take the mark. Very good effort by one of the Swans' bearded bandits. From 20 metres out he guides it through. The MCG is looking a pretty picture under the lights. The grass is a beautiful sight and is a tribute to the ground staff of the MCG. BEHIND MAGPIESSeedsman tries to snap one from 40 metres out but he misses to the right. GOAL SWANSSwans work it out of the middle with speed. Pyke presents as an option up forward and takes the grab. From 25 metres out he slots it through. Swans are on the board. GOAL MAGPIESCloke edges out his opponent and marks it overhead.He goes back from 20 metres out and kicks the goal. Magpies have started well. GOAL MAGPIESPendlebury marks and takes off. He kicks to the lead of Witts and he marks. Witts' kick at goal never looked like missing. Pies draw first blood. BEHIND SWANSO'Keefe's shot at goal is fumbled over the line by Jolly. BEHIND SWANSHannebery marks it 40 metres out but his kick is offline and through for a behind. BEHIND SWANSBolton's kick inside an empty 50 rolls and rolls and rolls. Russell dives with outstretched arms to touch it on the line. We are off and underway for Friday night football. Welcome to the home of football for Friday Night Footy. It's Collingwood vs Sydney from the MCG. Both sides are as selected with Ben Kennedy warming the bench with the lime vest for the Magpies. Jed Lamb starts the match as substitute for the Swans. Welcome to MCG for the Collingwood v Sydney Swans Round 9 clash. 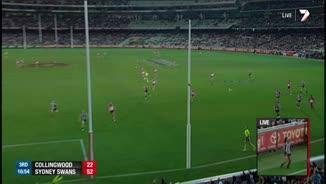 AN INCIDENT where dual Brownlow medallist Adam Goodes appeared to be racially vilified by a Collingwood fan has marred the Sydney Swans’ 47-point victory over the Magpies at the MCG on Friday night. The Swans completely smothered the Magpies' forwards and charged forward when in possession in the 15.12 (102) to 8.7 (55) victory, but the match will be remembered for the incident involving Goodes late in the fourth quarter with the result decided. After taking possession of the ball deep in defence, Goodes reacted to apparent abuse by a female Collingwood supporter. 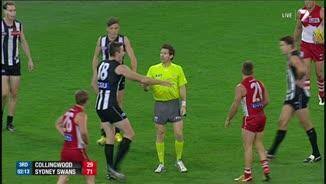 The supporter was ejected from the ground after being pointed out to security by the Swans star. 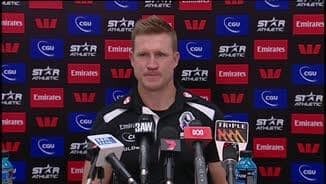 The incident came just two weeks after the Swans approached the AFL after Goodes was abused at the same venue in his side's 37-point loss to Hawthorn in round seven. Magpies president Eddie McGuire reacted with anger on Friday night, immediately seeking out Goodes in the rooms post-game to apologise. "Everyone knows the rules at Collingwood: if you racially vilify anybody, it's zero tolerance; you're out," McGuire told AFL.com.au. In the opening match of Indigenous Round, Goodes was superb for the victors, collecting 30 disposals up and down the wing and booting a team-high three goals as the reigning premiers repeatedly hurt Collingwood on the counter-attack. 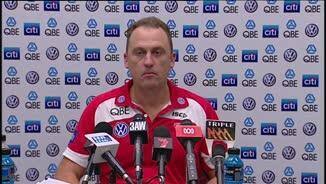 Swans coach John Longmire said Goodes' outstanding performance should not be forgotten amid the furore. "Adam was clearly disappointed and upset, and he's confident the AFL will work through it," Longmire said. "I think his performance was magnificent and we should also acknowledge that. He played so well. "He's a leader in his community and he's a powerful figure … the way he drove himself tonight was pretty special." The visitors’ dominance was reflected by Collingwood managing only one goal between the 25-minute mark of the first quarter and the four-minute mark of the last. The Swans booted 10 goals in the same period, getting out to a game-high 54-point lead. Only an improved last quarter from Nathan Buckley's men prevented the result from becoming a complete blowout. Alongside Goodes, midfielders Daniel Hannebery, Kieren Jack and Ryan O'Keefe all enjoyed big games. Hannebery's joy over the win was tempered by the Goodes controversy, the Swans midfielder saying the incident was "a disgrace" as several AFL stars took to Twitter to make their feelings known. 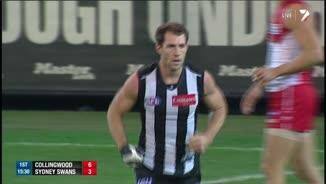 Down back, Nick Malceski continually found space as a loose man, and also provided important help for teammate Ted Richards on dangerous spearhead Travis Cloke (three goals) in an otherwise dysfunctional Magpies forward line. Scott Pendlebury played a typically determined game for the losers, gathering 28 disposals and hitting teammates lace-out on several occasions. Steele Sidebottom and Luke Ball also worked hard, while Brent Macaffer turned in a disciplined tagging effort on Josh Kennedy, holding the Swans' clearance specialist to 18 disposals. Buckley described his side as "sluggish" a week after its stirring win over Geelong. "There's no doubt that we looked like we lacked some pep tonight," the Collingwood coach said post-match. "We were half a step off where we needed to be. Part of that is psychological. "We didn't rest on our laurels. We set ourselves to come out and reinforce the performance of last week, because we've been up and down." A further dampener for Longmire's team was the loss of key forward Sam Reid with a left quad injury in the third quarter, although the 21-year-old was upbeat about his chances of playing next week when he spoke to his coach after the match. It was the Swans' first win over Collingwood at the MCG since round 19, 2000, and came despite a pre-game drama, with the team bus turning up late after breaking down on the way to the hotel, forcing some players onto public transport. 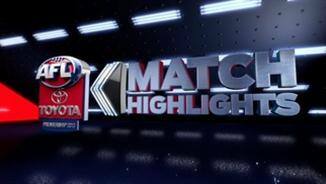 They have now won two straight over the Magpies after losing the previous 11. The loss leaves Collingwood at 5-4 for the season, and almost certain to drop out of the top eight by the end of the weekend. Already severely depleted by injury, they may be sweating on the fitness of Jordan Russell, who spent time on the bench with an ankle problem. He was, however, able to finish the game on the field. The Swans have moved to six wins, two losses and a draw, and are safe inside the top four for another week. The crowd of 65,306 was the second-largest home and away attendance for matches between the two clubs.